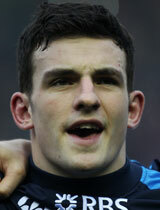 The Edinburgh centre made his Scotland debut as a replacement winger against Ireland in the 2012 Six Nations. He went on to start the next six internationals in his preferred position of centre. But it was not until the 2013 Six Nations that he really cemented his place in the side. And his strong form put him into contention for a place in the Lions squad to tour Australia.